Many wearables like the Fitbit Charge (2) and other wearables provide heartrate tracking. However, it is hard to comprehend 24 hours of HR-data. Therefore, many of these trackers only provide you with feedback on your resting heartrate. Jawbone up 4, Fitbit Charge 2, Beddit, Emfit and other healthtrackers, like Mybasis B1 use this tactic. Resting heart rate is a well know healthfactor, but what’s it worth? A study among 2798 males showed that a lower resting heart rate(RHR) is related to a higher degree of physical fitness (p<0.001). On the other side, an increasing RHR was highly associated with mortality in a graded manner after adjusting for physical fitness, leisure-time physical activity and other cardiovascular risk factors. With every 10 beats per minute increase for RHR, risk of mortality increased with 16%. Thus, it seems that RHR is quite important for health. However, my RHR varies over the days. And it does for everyone. Everyone who has a HR-tracker knows that. This changing RHR might have important implications for our health. But how come does it vary over the days? 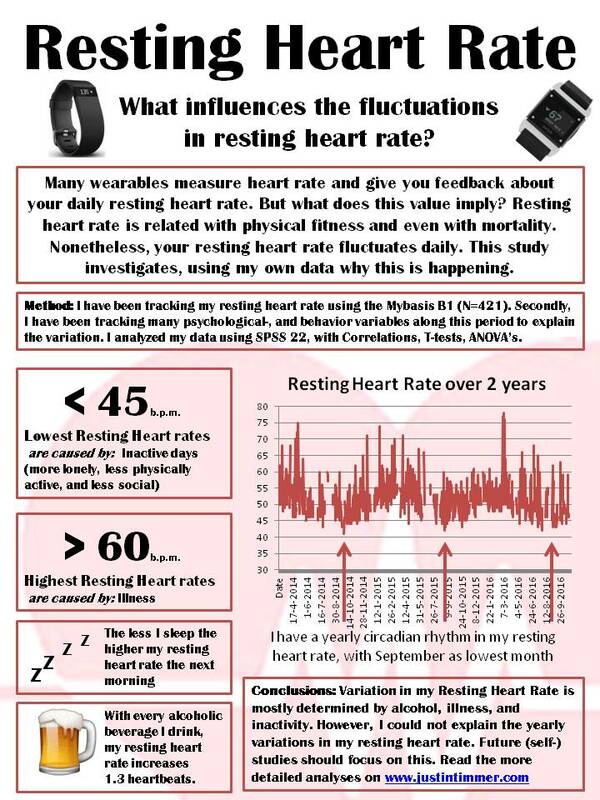 To find out the reasons why my resting heart rate varies, I am going to analyze which factors of my life influence my resting heart rate the next morning. Fortunately, I have been tracking my heart rate for over 2 years now. Mybasis B1 tracks my heart rate 24/7 but also tracks my RHR in the morning. As you might know, I track a lot of things which might be associated with my RHR. In the table below you can check what variables I used for this experiment. There are several factors that predict the fluctuation of my Resting heart rate. A lot of them are quite weak, but there are two factors that really stand out; alcohol use (r=0,526, p<0,001), and sleep duration (r=-,480, p<0.001). The more alcohol I drink, the higher my RHR is the next day. The relation is almost this strong that with every glass of beer, my heart rate is one beat higher the next morning. Secondly, sleep duration was a predictor. The data showed that the less I sleep, the higher my heart rate is in the morning. You might think that alcohol use and sleep duration go often go hand in hand; however, my data did not show that (they were not correlated). Thus, these two are independent predictors. Sleeping longer and avoid alcohol is my advice to get a lower resting heart rate. Other variables that showed relations with resting heart rate were happiness, loneliness, sociality, and productivity. All these relations were very weak (a strength lower than 0.228). And these variables are often related to alcohol, and sleep duration. Thus, I won’t spend much time on analyzing those. My data shows that my resting heart rate is highest on Thursday, Saturday, and Sunday. When I drink alcohol, I usually drink it on Wednesday, Friday or Saturday. Thus, in terms of recovering in the weekend with a lower resting heart rate, this doesn’t happen for me. My data showed that I have huge differences between my resting heart rates. My average resting heart rate is 50 beats per minute (bpm), but sometimes I have low resting heart rates between the 40 and 45 bpm. What causes these low heart rates? These reasons supposed to be good right? In these two years I had 36 cases where my heart rate was lower than 45 bpm. I analyzed these cases and found that the days before a low heart rate, I was often more lonely, less physically active, and less social. So doing nothing is good for a lower resting heart rate. Suddenly, a really low decline in resting heart rate doesn’t sound so good does it? A more complex methods of analyses is needed here. There are probably long-term effects of things like exercise on resting heart rate which do not show the next day after. On the other hand, I had also very high resting heart rates with a high-score of 78 bpm. 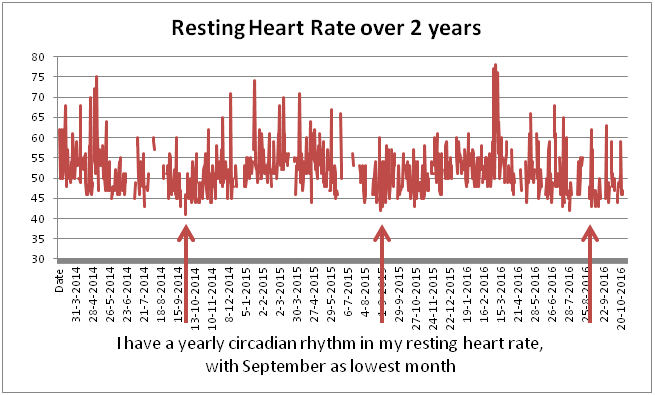 The cases where my heart rate was higher than 60 bpm (8 cases in two years), I was ill, or close to being ill.
One of the most interesting things I found was the yearly variation in my resting heart rate (see figure 1). In September I have the lowest RHR, and then it inclines until December, reaching it highest point. It is unclear why this is happening, September isn’t the hottest month, and December isn’t the coldest. Thus, there should be another reason. This finding requires more investigations. However, this is beyond the scope of this study. My results showed that the fluctuations in my resting heart rate is mostly moderated by alcohol use and sleep duration. This study concerned the fluctuations of resting heart rate within me, over time. Thus, if you have a higher or lower resting heart rate it does not mean that you drink more alcohol for example. There are many genetic and fitness factors involved that cause differences between people. It was interesting to see how much alcohol use influences my resting heart rate. It is clear that although you might feel like sleeping well after drinking alcohol, your body is not well rested the day after (if you take RHR as a measure). But I am sure that everyone notices this when waking up after a good party. The second interesting thing I learned, is that stress does not influence my resting heart rate. I had expected that stress caused an increase of heart rate but this was not the case. Secondly, there was no linear correlation between perceived health and resting heart rate. Only when I was (really) ill, my heart rate was higher. Lastly, I found a yearly variation within my resting heart rate. That was totally unexpected, in a next study I will investigate why this is happening. For now, this is beyond the scope of the study. in a next study I might investigate whether taking resting heart rate as a measure has any meaningful implications. Does a low morning heart rate have any influence on the rest of the day? Quick question – how do you download the resting heart rate data? I don’t think Quantified Bob’s scripts do it, or do they? Hey Justin! Thanks! Great to know you are reading this. I got it straight from the Mybasis.com website. Resting Heart rate was in one of the files you could download straight from the website the last few months. Hey, great to see your conclusions! 🙂 Love seeing that yearly change in RHR. Will keep an eye out for when you draw conclusions on it. And might see you in Amsterdam in June at the conference? Someone on QS-Facebook page suggested light/dark variation of the day. I’ll do some more research on that. Yes I am at the conference in June, see you there! I absolutelү l᧐ve your blog and find most of your poѕt’s to be exactly I’m looking for. on most of the subjects you write witһ regards to here. Great post, how innovative! 🙂 What statistical model did you use if you don’t mind me asking? Thanks! It’s been a while, how sloppy that I didn’t report them in the post. However, I used linear regression and looked at some pearson correlations.